While the rest of Australia is digging out the winter woolies, on Queensland's Sunshine Coast it's still shorts and t-shirt weather. Access is a breeze too - just an hour's drive from Brisbane or a quick hop into Maroochydore airport, and you'll be sinking your toes into the sand in no time. Go on, the kids will love you for it! Whether you have littlies who just want to make sandcastle and paddle in the shallows or bigger kids who want to hang ten in the frothy rollers, the Sunshine Coast has got you covered. Take your pick from more than 100 kilometres of both calm and surf beaches. Caloundra, at the southern end of the coast is the perfect kid-friendly spot for a bucket and spade holiday. You'll find more gentle waves, patrolled beaches, picnic spots and a 25-metre seawater lap pool equipped with a children's pool with plenty of shade. Kawana Surf School will have budding surfies aged from 8 to 80 standing up in your first lesson! The Coast is famous for beaches, but venture to its hinterlands and National Parks and you'll discover the cool, lush green behind the gold. The Glasshouse Mountains, Blackall Range, Noosa Hinterland and Mary Valley offer waterfalls, picnic spots and bush walks suitable for children of all ages from challenging hikes for the older kids to easy 20-minute circuit tracks for the toddlers. The Sunshine Coast is packed with heart-pumping and hair-raising activities as well as soft adventures for the little ones. Get your adrenaline fix at The Big Kart Track – the largest commercial go-kart track in Australia. It features a fully-supervised track exclusively for kids. 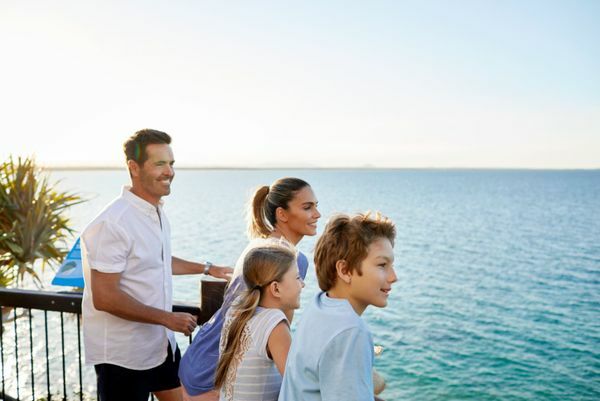 Soft adventures can cruise the canals and open sea of Mooloolaba with Liquid Getaway to learn about the marine ecology and spot dolphins, turtles and rays. Older kids can try out kite surfing in Noosa or Coolum with Adventure Sports Kitesurf. There's also diving, kayaking, adventure tours, jet skiing, bicycle tours, horse trail rides, jet boating and four-wheel drive safaris – the list of adventures is almost endless! There's more than enough fun for the family at the Sunshine Coast's many theme parks. Aussie World family fun park is guaranteed to please children of all ages, with more than 30 rides and games, including rollercoasters, dodgems and the second largest Ferris wheel in the southern hemisphere. Take a walk on the wild side at the Sunshine Coast's famous Australia Zoo. There's a special tour just for kids, taking in the Wildlife Warriors show, elephant feeding, and photos with a koala and a reptile. UnderWater World Sea Life, features Queensland's largest oceanarium and viewing tunnel. The award-winning attraction has a 'Touch and Tell Zone', where kids can get up close and touch sea stars, sea cucumbers and other sea creatures. Accommodation on the Sunshine Coast is as diverse as the region. There are hundreds of family-friendly options, from self-contained apartments, camping spots and caravan parks, to resorts or even farm stays. Check out Queensland.com. The Sunshine Coast Airport is serviced by Jetstar, Virgin Blue and Tiger Airways. If you're landing in Brisbane, the Sunshine Coast is approximately a 75-minute drive away. You can get between the Brisbane Airport and the Sunshine Coast via Airtrain, Sun-air Bus Service, which operates a door-to-door shuttle bus service, or Cols Airport Shuttle. This Press Release or Biography or Copyright Free Story is supplied courtesy of Tourism and events Queensland. For more information, please go to www.queensland.com or www.blog.queensland.com. For images, please visit https://visuals.queensland.com/.